The integration of 'logistics thinking of firms' in long-term transport policymaking has become an important means for supporting industries. Research projects in this field have focused on understanding logistics patterns and trends of various industries in order to identify their needs in terms of logistics requirements. None of these projects, however, have focused on innovative firms despite their higher importance to economic growth. This paper presents a research project that aims to acquire a better understanding of logistics behaviour of innovative firms, and to investigate the implications of innovative economic activities for transport logistics requirements in the small-scale economy of Tasmania. 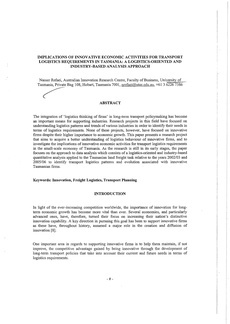 As the research is still in its early stages, the paper focuses on the approach to data analysis which consists of a logistics-oriented and industry-based quantitative analysis applied to the Tasmanian land freight task relative to the years 2002/03 and 2005/06 to identify transport logistics patterns and evolution associated with innovative Tasmanian firms.